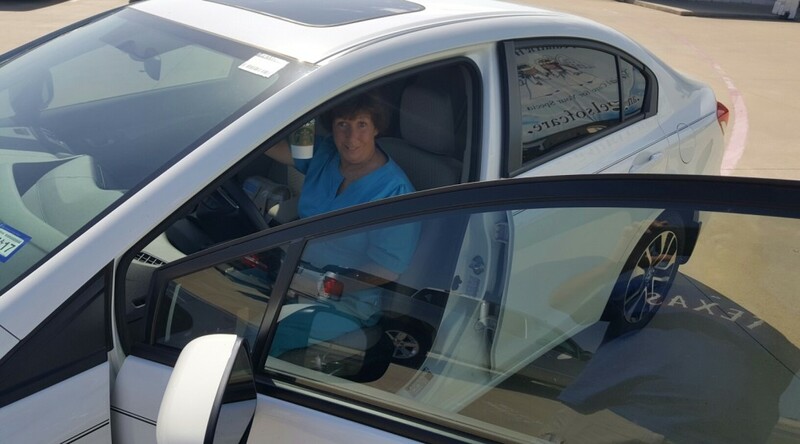 2016 Employee Car Drawing Winner- Debra Maas! This year, we were honored to giveaway a brand new Honda Civic to a well-deserving nurse! Read what Debra Maas had to say about getting that surprise phone call on this very special day! “I can’t believe I won a car! My nursing career started in 2004 as a full time field nurse with AOC. We were small back then, with 80 nurses & 1 office. I have watched the company grow over the years and always enjoy watching the winners of the monthly drawings & car giveaways. 12 years later & I am still a full time field nurse for AOC that now has over 2,000 nurses & 13 offices. On July 11,2016, after a grueling weekend of ‘things gone wrong’ I received a call at home from Bonnie West telling me I had won a car! It is such a great feeling to know that I am appreciated! Thank you Bonnie & the Angels of Care staff for giving me such a great experience!” -Debra Mass, LVN. Thank you, Debra Mass for all that you do & for being a loyal team member with Angels of Care! Congrats! Interested in being eligible for the next car drawing? Apply Today!